Chasing trains to make movies. What a way to kick off 2013! I had no idea how exhausting, hot or nerve-racking it would be. At one point we were driving through the Karoo, car doors open with our cameraman hanging out to “get the shot”. It was quite soon into my new role at Rovos Rail that I realised our video collateral needed some serious updating. These shoots cost a pretty penny and it’s easy to push them to bottom of the list because operating trains is a costly business. But the way of the world is video and I wanted to create movie magic. I enlisted the assistance of a production company, Big House, along with our trusted photographer and videographer, Ross Hillier. We’ve known Ross a long time and his work is beautiful. Plus he’s always up for any adventure and chasing trains ranks high on a list of cool things to do! So off we set on a hot Pretoria afternoon to follow the train to Cape Town. None of us really knew what to expect and, if I’m really honest, I still can’t believe that not one punch was thrown! The temperatures were fierce, the driving fast and tedious, the nights late with only about two hours sleep each evening and meals were sporadic and junky. We waited alongside the train tracks in De Aar, in the Karoo, for over an hour and the recorded temperature was 42°C. But even in these tough conditions the funny banter never stopped and there were times when we all cried from laughter. There is just something special about putting the right group of people together, magic happens, and that’s what we shared on our three-day 1 500km quest. Now fairly addicted to the adrenalin of a film shoot, I decided we needed to capture our Durban Safari too. 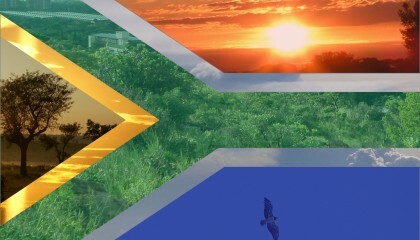 KwaZulu-Natal and its Midlands has some of the most spectacular scenery that South Africa has to offer. The vegetation is tropical, lush and so blindingly green that the contrast between the arid Karoo, I knew, would make for beautiful footage. So off we set again and aside from an initial vehicle breakdown that resulted in a hilarious afternoon spent in a mechanic’s garage in Alberton, this trip was far easier. The travel distance was just much shorter so there was less driving and more sleeping! But wow, did we see South Africa’s raw beauty. The train passes through a tiny station called Balgowan at about 6am, which is right next to Michaelhouse in the Midlands, and the mist that morning was all the colours of the most beautiful sunrise which seemed to blanket the train as it meandered slowly and quietly passed us. It was a sight and a feeling I will never forget. Another special moment was filming a time lapse of the sunrise on Mount Alice. Rovos Rail guests enjoy a fascinating lecture on the Anglo-Boer War on Mount Alice so we snuck up a bit earlier to capture the valley at sunrise and to film the lecture given by raconteur, Ray Herron. It was a few months later, at the beginning of winter, that I realised I didn’t have enough footage of guests on board so I sent the crew on another Cape Town journey but this time they got to travel on board. On the second evening, the train parks at a siding called Gemsbok, situated somewhere in the Karoo, and the crew braved the wintry temperatures to film a time-lapse of the beautiful night sky. Being city slickers, a sky on fire is not something often seen so it had to be captured and was a magical experience even in the sub-zero temperatures. My only real job on all of these shoots was to ensure guests were happy, to keep the crew fed and to pay for fuel! But one thing I did do was film our adventures on my iPhone. The footage was used to make a behind-the-scenes video which, I admit, is mostly just for our memory banks and entertainment but if you would like to see the escapades then click here.